Minneapolis, MN – The YMCA of the Greater Twin Cities, a leading nonprofit dedicated to strengthening communities through youth development, healthy living and social responsibility, presented Youth Thrive awards to 39 youth leaders across the metro area who have made an impact on their communities while demonstrating a commitment to the Y’s core values of caring, honesty, respect and responsibility. 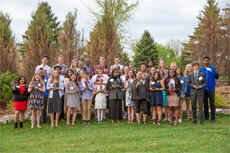 The YMCA of the Greater Twin Cities, a leading nonprofit dedicated to strengthening communities through youth development, healthy living and social responsibility, presented Youth Thrive awards to 39 youth leaders across the metro area who have made an impact on their communities while demonstrating a commitment to the Y’s core values of caring, honesty, respect and responsibility. The YMCA of the Greater Twin Cities is a leading nonprofit dedicated to strengthening communities through youth development, healthy living and social responsibility. Established 162 years ago, the Ys provide life-strengthening services across the greater Twin Cities metro region, southeastern Minnesota and western Wisconsin communities. The 29 Y locations and program sites, seven overnight camps, 10 day camps, and more than 90 child care sites engage more than 350,000 men, women and children of all ages, incomes and backgrounds. To learn more about the Y’s mission and work, visit www.ymcamn.org.